The International Association for the Study of Pain (IASP) definition of pain highlights the multidimensional components of pain. The interaction of these dimensions (sensory/discriminative: intensity, location, quality and behaviour of pain, cognitive-evaluative: thoughts of the pain as influenced by previous experiences and knowledge, and motivational-affective: emotional response like anger, anxiety and fear that motivates the response to pain) all contribute to the complexity of the painful experience. An individual’s belief systems, pain understanding, thoughts & emotions: anxiety; depression; catastrophizing ( or their psychology) influence how the brain interprets a noxious stimulus in relation to the meaning and level of threat the stimulus pose; to well-being, and thereby influences the resulting output from the brain, including resulting behaviour (i.e. avoidance) as fear avoidance, catastrophizing, pain-related anxiety, stress and learned helplessness can impact upon a pain experience and a patient's coping strategies. While this is unlikely to be an exclusive list of influential psychosocial factors, these are well researched and evidenced. This page will review each of these in turn. Pain and Fear Fear is a typical emotional response to an experience that is perceived to be threatening, such as one that leads to a pain sensation . Future avoidance of the painful activity is often the resulting behaviour adopted to protect oneself from a repeat of the fearful emotion and painful experience. This pattern can lead to fear and avoidance of work-related activities, movement, and re-injury . Kinesophobia is a term used interchangeably with fear avoidance in health and pain literature. It is defined as “an excessive, irrational, and debilitating fear of physical movement and activity resulting from a feeling of vulnerability to painful injury or reinjury.”. In response to acute tissue damage/injury, feelings of fear are heightened as part of a normal consequence of pain . The individual will rest and protect the painful area as an adaptive behaviour to allow tissue healing to occur. As the acute phase and initial tissue healing resolves, it has been suggested that some individuals can confront their fearful emotions and are able to resume normal activities, which ultimately extinguish their fears as they experience positive increase in mobility/movement unassociated with further increase in pain  . For others, they may be unable to overcome the fearful emotion and the resulting avoidance behaviour persists . A cycle of continued activity avoidance and fearful emotions may ensue, the longstanding effect of which in patients with chronic pain may have an adverse effect on the musculoskeletal and cardiovascular system (disuse syndrome), which fundamentally increases disability. Several models have been proposed to explain the persistence of 'fear-avoidance' and its impact on pain and behaviour. Vlaeyen and Linton  have described the interconnections contributing to fear avoidance as follows: with negative appraisals of a painful experience, fear avoidance behaviours are elicited. Due to hypervigilance, the avoidance behaviour begins to occur in anticipation rather than in response to pain. As there are fewer and fewer opportunities to correct the wrongful association of pain with the avoided activity, the behaviour perpetuates itself and fear avoidance persists. While the above models explained how fear avoidance becomes a maladaptive coping strategy and barrier to recovery in patients with chronic pain, this information may also be relevant to clinicians dealing with patients in the acute stages of injury. Any early fear avoidance behaviours, especially for those who have strong negative cognitions about their pain like anxiety and depression, could be identified. These patients could be monitored so they do not continue with this coping strategy once the acute stage has passed. Knowing what factors affect fear avoidance would help clinicians elicit these behaviours in their patients, expose any wrongful beliefs, attitudes or coping strategies (active vs passive) patient may have about their pain and recovery (Psychological_approaches_to_pain_management) and determine the best way to challenge them. affective avoiders who are distressed and have strong negative cognitions about the pain; may need more cognition-based management and challenge beliefs . Disuse or disability from persistent avoidance behavior will experience pain with much less provocation than before (lower the threshold for experiencing future pain). Anxiety is described as a general term for several disorders that include; uneasiness, apprehension, nervousness, fear and worrying. The prevalence of patients in each study purely with anxiety varied throughout, from 18 to 72% of those recruited. Unfortunately much of this literature does not solely focus on anxiety alone. The following have been commonly reported anxiety symptoms reported in patients with chronic pain; “not being able to stop worrying”, “worrying about too many different things” and “feeling as though something awful might happen”. A study which aimed to evaluate the prediction of chronic pain looked at anxiety, depression and social stressors as risk factors and the severity of pain at 3, 6 and 12 months in 250 patients. They found a strong correlation between baseline anxiety which predicted pain severity at 12 months. Interestingly no correlation was found for social stressors or depression. In a TMsI study, anxiety was found to predict pain intensity at different time-frames post injury whereas depression, social support, length of hospital stay and self-efficacy had no substantial effect. They summarised that pain predicted anxiety and depression in the first year, but anxiety only predicted pain intensity from 12-24 months. Anxiety symptoms were therefore hypothesised as the primary causative factor of persistent pain in this cohort study. It is therefore important to address patients anxiety early to prevent it persisting and causing a negative barrier to their recovery. One study examined the validity of a single question to screen for depression and anxiety. Single question screening tools were compared with validated questionnaires such as mini-international neuropsychiatric interview, HAD scale and Hopkins symptom checklist. It was found that the single questions demonstrated fair ability to detecting anxiety with a sensitivity of 68% and a good ability to exclude anxiety with a specificity of 85%. Therefore single question screening tools are fairly effective in identifying anxiety and could be utilised into early assessments with chronic pain patients. Depression is described as a general term for mental disorders which include; sadness, loss of interest or pleasure, feelings of low self-worth and low mood. Some frequently reported depressive symptoms among chronic pain patients are; “thinking of suicide/self harm” and “feeling down, depressed or hopeless”. Depression alone is associated with; chronic MSK and widespread pain , knee pain, low back pain and chronic pelvic pain/prostatitis. In a study examining the impact of anxiety and depression in phantom limb pain (PLP) patients mean depression scores were higher, although non-significant, in patients with non-PLP chronic pain syndromes. A study of low back pain observed higher prevalence of depression symptoms (13.7%) compared to anxiety symptoms (9.5%). Similarly, a cohort of 400 patients with chronic myofascial or neuropathic pain demonstrated higher prevalence of depression (93%) than anxiety (72%), however this was contradicted by opposing findings in 400 chronic pain patients (pathology not given) with higher observed levels of anxiety (70%) compared to depression (60%) although depression was reported at a ‘non-significant level’. It is therefore extremely important to determine the individual needs of your patient through a comprehensive subjective and objective assessment. A study which looked into risk factors for chronic widespread pain reported higher levels (87%) of persistent pain in patients with both anxiety and depression compared to in isolation (35% & 66% respectively). While a study in Brazil which included 400 chronic pain patients observed 54% with both of the psychiatric disorders compared to anxiety (18%) or depression (7%) alone. In patients with chronic musculoskeletal pain, those with both anxiety and depression experienced the greatest pain severity, a highly significant finding. Furthermore combined psychiatric co-morbidity was strongly associated with disability days with; 18.1 days in pain only patients, 32.2 in those with pain and anxiety, 38.0 days in those with pain and depression and 42.6 days in those with all three conditions. This study also found a significant correlation with reduced QoL when all three conditions presented together. d) cause more severe functional deficit together than when presenting independently. Many studies have looked into the pathophysiology of pain, anxiety and depression to find answers and to facilitate more successful treatment of these complex conditions. It is known that a state of acute anxiety stimulates the sympathetic nervous system (SNS) causing increased muscle tension, increased nociceptive input and increased sensitivity to pain stimuli , thus explaining why anxiety may correspond to increased pain perception. Corticosteroid hormones, for example, released after stress may play a part in pain modulation as cortisol (a steroid hormone known to stimulate the SNS) has been found in higher levels in those with chronic pain. Furthermore neurotransmitters, neuropeptides and pro-inflammatory cytokines have been found to either mediate or modulate pain. Therefore these physiological processes overlap in both anxiety and pain. There is evidence accumulating to show atypical sensory processing in the brain and dysfunction of skeletal muscle nociception, however the latter may not explain pain persistence in non-MSK pathologies where chronic pain has clearly been observed. The “pain matrix”, responsible for modulation of pain signals in the central nervous system (CNS), shares elements with brain networks responsible for stress, identifying another connection to the SNS. Pain contributes to feelings of anxiety due to fear of the cause and if this persists a state of hypervigilance and avoidance behaviours may develop as a “maladaptive” coping response. A more permanent state of anxiety results in chronic muscle tension and anticipatory anxiety which leads to even more disability. Decreases in activities, especially those which provide meaning and reinforcement, may result in greater social isolation, decreased self-efficacy, increased feelings of uselessness and subsequent increases in anxiety and depression symptoms. This theory is closely interlinked with the ‘fear-avoidance’ model, a cycle prospected to play a vital part in sustenance of pain behaviours and has been shown to be an independent predictor of pain severity and disability among those with MSK pain. Functional magnetic resonance imaging (fMRI) studies along with blood-oxygenated level dependent contrast (BOLD) techniques have been utilised in various studies to map common areas of brain activation by detecting changes in blood flow. These studies have been able to map similar areas of brain activation for anxiety and pain. It has been shown that there is exaggerated brain response in patients with social anxiety disorder[. In one study these methods were used to identify highlighted areas in the brain when anxious patients reacted to negative self-beliefs. The areas identified were the midline cortical regions such as; the ventromedial pre-frontal cortex (PFC), dorsomedial PFC, posterior cingulate cortex (implicated in self-referential process), emotional centre (amygdala) and memory area (hippocampal gyrus). This indicates that there are integrated neural pathways associated with anxiety, pain processing, memory and concept of the self – the latter potentially implicating personality traits into anxiety and pain. There is less known evidence about the physiology of depression compared to anxiety however it has been postulated that people with depression or a depressive personality have a greater sensitivity to acute and chronic pain. Similarly to anxiety, excessive sympathetic activity and elevated pro-inflammatory cytokine production is also postulated in the aetiology of depression thus providing a potential physiological link between all three conditions and a possible reason for the overlapping prevalence within patient presentations. In diabetic patients with depression, similar brain activation was identified in both neuropathic and non-neuropathic pain patients; these were PFC, thalamus, insula and anterior cingulate cortex. 13 patients suffering from an acute episode of major depressive disorder (MDD) were investigated during painful stimulus application and compared to 13 control subjects. The results demonstrated increased activation of the pain matrix and increased thermal pain thresholds compared to healthy subjects. They speculated that the brain area activation may be linked to an underlying prefrontal psychopathology in depression. In another BOLD study patients with diagnosed MDD showed greater activation of pain-related brain sites (right insular, dorsal anterior cingulate, right amygdala) during anticipation of painful, heat stimuli compared with healthy subjects. Furthermore in MDD subjects, greater activation of the amygdala was associated with greater levels of perceived helplessness. This implies anticipation of pain may further pain experience and activation of the pain matrix potentially contributing to persistence of pain. In other studies the cingulate and PFC has also been implicated in pain modulation and may contribute to chronic pain associated with fibromyalgia syndrome. The brain is perceived as a mediator for nociceptive pain, but also for pain behaviours which are known to influence pain itself, likely causing its persistence. ‘Central sensitisation syndrome’ (CSS) is a highly recognised symptom of chronic pain syndrome. Hyperaesthesia and allodynia (increased sensitivity to painful and non-painful stimuli) are features of CSS and have been suggested to be mediated by synaptic strengthening and neuroplastic change at multiple CNS levels further strengthening the hypothesis of the brains role in nociceptive changes in the peripheries. The authors of this article proposed that anxiety and depression may have similar physiological effects on programming in the brain providing more evidence for the relationship. It is clear from research studies that physiology of depression, anxiety and pain is overlapping. However it is difficult to establish which the primary cause is and which is secondary. "Pain catastrophizing refers to a negative cognitive-affective response to anticipated or actual pain . It was formally introduced by Albert Ellis and was used to describe a mal-adaptive cognitive style in those with anxiety and depressive disorders . The research focussed on the fact that catastrophizing was an exaggerated and negative cognitive and emotional response during an actual or anticipated painful stimulation. Catastrophizing is often characterised by people magnifying their feelings about painful situations and ruminating about them which can combine with feelings of helplessness. Catastrophizing plays an important role in models of pain chronicity, showing a high correlation with both pain intensity and disability <. However, it is also apparent that fear avoidance and depression are important predictors of pain intensity and disability . High correlations between fear avoidance and pain catastrophizing have been found , however only pain catastrophizing predicted pain intensity. Additionally, catastrophizing has also been linked to adverse pain outcomes  and it can therefore be surmised that a reduction in pain catastrophizing will lead to a reduction in pain and disability . This highlights the importance of a multifactorial approach to pain management and the significance catastrophizing has in moulding the pain experience. How can we assess the levels of catastrophizing? There are various theoretical mechanisms of action including the appraisal theory  where the levels of helplessness the person is feeling will affect their ability to cope. Attention bias/information processing  where the catastrophizing amplifies the experience of pain via amplified attention biases to sensory and affective pain information  and an inability to suppress pain related cognitions  . Evidence has also suggested that there is an increased nociceptive transmission via spinal gating mechanisms and a central sensitisation of pain. This may represent a central nervous mechanism which is contributing to the development, maintenance and aggravation of persistent pain    . It is therefore apparent that both psychological and physiological factors play a huge part in the perception, maintenance, experience and management of pain and both directly influence each other. It is important to recognise these factors in both the acute and chronic pain patient in order to understand what aspects of their pain are a barrier to their recovery. A physiologic stress response may be evoked by fear or perceived threat to safety, status, or well-being and elicits the secretion of sympathetic catecholamines (epinephrine and norepinephrine) and neuroendocrine hormones (cortisol) to promote survival and motivate success. Cortisol is a potent anti-inflammatory that functions to mobilize glucose reserves for energy and modulate inflammation. Cortisol also may facilitate the consolidation of fear-based memories for future survival and avoidance of danger. 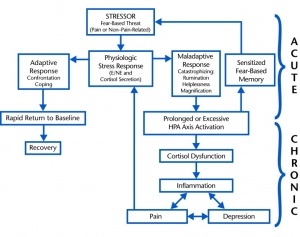 Although short-term stress may be adaptive, maladaptive responses (eg, magnification, rumination, helplessness) to pain or non–pain-related stressors may intensify cortisol secretion and condition a sensitized physiologic stress response that is readily recruited. Ultimately, a prolonged or exaggerated stress response may perpetuate cortisol dysfunction, widespread inflammation, and pain. Needless to say, a delicate balance between sympathetic and parasympathetic activity is critical for long-term physical and psychological health. Maladaptive cognitive appraisals or beliefs regarding the threatening nature of potential stressors may promote an exaggerated physiologic stress response that is likely to initiate, exacerbate, or prolong the pain experience. Whether the stress-provoking stimulus is pain or non–pain-related, chronic reactivation of the stress response and repeated surges of cortisol result in cortisol dysfunction. Prior to addressing non–pain-related stress in pain management, it is important to identify patients most likely to benefit from stress management. Objective measures of cortisol may be obtained from blood, saliva, urine, or hair; however, laboratory tests may not be appropriate for the physical therapy setting, and each test has specific limitations. Alternatively, there are a multitude of subjective measures of self-reported stress that may be easily integrated into the screening process. Following the identification of stress or maladaptive coping skills during initial screening, educating patients about the role of stress in the pain experience may allow for cortical inhibition of emotional fear-based responses to nonthreatening stimuli.20,24,25 Additionally, awareness of the influence of non–pain-related stress in the pain experience may allow patients to address non–pain-related stressors, thereby facilitating pain rehabilitation. ↑ Grotle M, Vollestad NK, Veierod MB, Brox JI. Fear-avoidance beliefs and distress in relation to disability in acute and chronic back pain. Pain 2004; 112: 343-352. ↑ Reme SE, Lie SA and Eriksen HR. Are 2 Questions Enough to Screen for Depression and Anxiety in Patients With Chronic Low Back Pain? Spine journal 39; 7 (2014) 455-462, doi:10.1097/BRS.0000000000000214, Accessed 06/11/14. ↑ Phyomaung PP, Dubowitz J, Cicuttini FM, Fernando S, Wluka AE, Raaijmaakers P, Wang Y and Urquhart D. Are depression, anxiety and poor mental health risk factors for knee pain? A systematic review. BMC Musculoskeletal Disorders; 15, 10 (2014), doi:10.1186/1471-2474-15-10, Accessed 01/11/14.